I have spent days pouring over the blueprints for the house, discovering a few interesting things along the way. 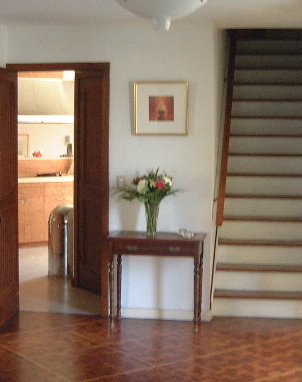 On the original blueprints the entry way had a flagstone floor. This made perfect modernist sense: the path to the front door was also flagstone so the inside and outside flowed together. I am actually quite glad decided to floor the entry and great room with parquet as it's warmer and is great for working out: put on a pair of socks and glide as if you are on a Nordic trainer. The carpet in the downstairs powder room should have been ceramic tiles and when we have saved enough money to redo the kitchen it will be tiled at the same time. The windows originally were all 6'x4' units but some were changed to smaller 4'x2' rectangles. The duo square windows in the master were planned as rectangles and we may change them back as it will be $500 cheaper that way. 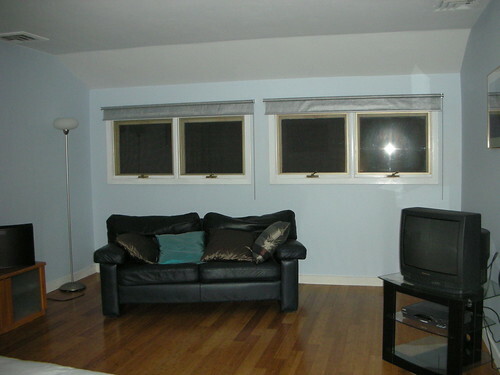 Most notably different was the living room, or as we call it, the den. On the blueprints the floor is level, no raised platform dividing the room into triangles. I really want to talk to Mr Geller to see if this change was incorporated after the first blueprints were drawn up and if there is a structural reason for keeping it. If there isn't, I'm thinking about removing the platform altogether. Anyway, I thought I'd identified all the differences between the blueprints and the house we live in until today. I asked Atlantic Blueprint to scan the plans onto a CD rom and I spent an hour or so carefully examing them. It was as if I was looking at them with a new eye, things jumped out at me: The kitchen cabinets had been planned differently and the wall of windows became a half wall of windows and a sliding door. But it was when I came to the laundry room that I got really excited. The plans called for a recessed ironing board. How neat is that? I checked out the wall in the laundry room but there is no trace that it ever held such a contraption. I don't iron but I'd love to fit such a thing in the space.